Thoughtful words can change you and inspire you to reach new places within your heart. 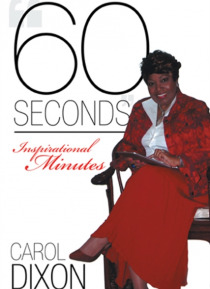 60 Seconds was created to breathe wonderful things into your spirit, beautiful words that surround, words that heal and bring change; ordinary words and expressions uttered together that propose favorable opportunities.In this book, you will find inspiring words through application of Scripture for all mankind. … It offers new thoughts and insight into who you are and the likelihood of shame, embarrassment and low self-esteem never being a thought anymore. You can begin to experience a life of victory in every situation, simply because you took 60 Seconds to be inspired!